Last November, I made a trip to the Philippines with two of my friends for the first time. Mr. A. and Mr. U. are my dearest friends from high school and we have been friends for 40 years by now. We had often talked about how nice it would be if we could go abroad together someday. One day, Mr. U. said that he wanted us to go to the Philippines with him to pay a visit to his father's grave representing his family. 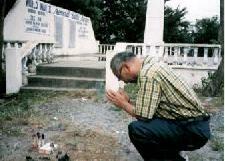 His father died in 1945 in Baguio during World War II when Mr. U. was only two years old. He had never met his father. We supported the idea because Mr. A. goes to the Philippines frequently and I had recently become interested in visiting Asian countries. Thus, this journey was planned and became true. On the 1st of November, Mr. U. and I arrived at Manila International Airport during the night where we met Mr. A. who had come earlier. We started to drive to Baguio which is located 250km away from Manila. Mr. M.who is Mr. A. 's Japanese friend had lived there for 7 years and he as well as his driver drove with us. Baguio, located in 1,500m above sea-level, is well known as a summer resort like Karuizawa in Japan and was in the old days called the "Summer Capital" where the government agencies was temporarily relocated during March and May every year. After dividing from the main road we climbed a mountain road and stopped the car abruptly to watch the night sky. It was too beautiful to continue driving and we felt as if we were back in our boyhood ! It seemed as if the stars were close enough to be reached with our bare hands in clear sky. We were deeply impressed to have come here all the way from Manila and checked in at a Spanish styled lodge 5 o'clock in the morning to take a short rest. I woke up at 8 o'clock unexpectedly as I slept intermittently in the car. Then, I found that many T.V. stations were broadcasting a religious program which reminded me that the Philippines is the only Christian country in Asia and that 93% of population are Christian. I remembered Mr. M.'s words that a group of boys and girls walking along the road last night were coming back home from church attending the service. We, Japanese tend to rely on religion only on special occasions (i.e. weddings and funerals). I think that it might be the reason why crime cases of morale-hazard are increasing in number nowadays. Thus, I became somewhat melancholic being in a foreign country and thinking over the spiritual fundamentals of Japan compared with those of the Philippines. We reached Bacnotan at noon which was our final destination of the day. It took us about two hours to climb down to the junction from the main road that runs in north-south direction along South China Sea. We enjoyed the beautiful view of the seashore line when driving the car, though we had not recognized it the previous night. 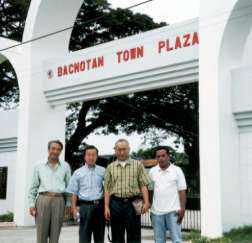 Mr. U. had not known that his father died in Bacnotan on military service until his family arranged his mother's personal belongings after she died last September. We only knew the name of the place but nobody knew where his body was buried. We were delighted to think that we would discover his tomb located among many monuments in the town plaza. However, when we came closer we found out at last that the monuments were only dedicated for the people who were devoted to the development of the town. Therefore, we could not find the tomb in spite of our expectations. We were obliged to perform the memorial service for his father by the War Monument located on the roadside going back to the main road. We one by one prayed sincerely for his father in front of his mother's picture, which Mr.U had brought along from Japan. We could share the feeling of accomplishment that Mr. U. must have felt since Mr. A. and I had lost our parents already. It was very nice to be able to share this experience with one of our dearest friends. Filipinos tend to behave very kindly to make those people feel at home, who act thoughtfully towards them. But, if Filipinos find that people are unthoughtful, they will react on the contrary as they are very sensitive. We, travelers visiting a foreign country, have to behave with courtesy and avoid selfish behavior in a free-set atmosphere. It will be a great relief to develop friendship with cheerful Filipinos if you add only one word in Tagalog (SALAMAT) -Thank you- when you talk with them. Remember, people have their own way of living different from yours. -- from a pamphlet for travelers published by the Philippines Government.